Killdeer are shore birds and members of the Banded Plover family (Genus Charadrius). They are slightly smaller than their unbanded relatives. Their diet consists of small insects and marine animals from the shoreline or grasslands. Notice the short neck and how the Killdeer holds it's tail - horizontal to it's body, not downward. Killdeer have shorter tails than their Plover relatives and boast an orange patch or accent on their upper tail and lower back. 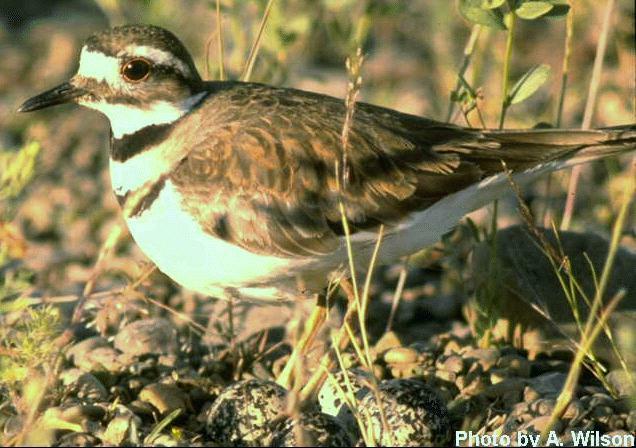 The photo shown here is an adult killdeer. Young or adolescent Killdeer have a single band around their neck. Notice also, the pointed and narrow wings. In field observation, you can identify the Killdeer by the Plover family trait of taking several quick steps and pausing, then repeating the quick movement and stopping. Their flight pattern is fast and straight. 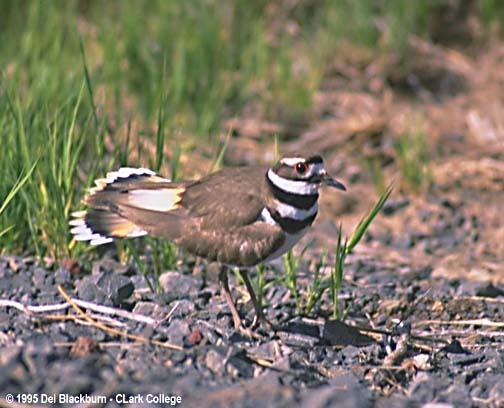 You will find Killdeer commonly in pastures away from water. They are very protective of their nests. If you approach a Killdeer nest, it will pretend to be injured to distract you away from its young.